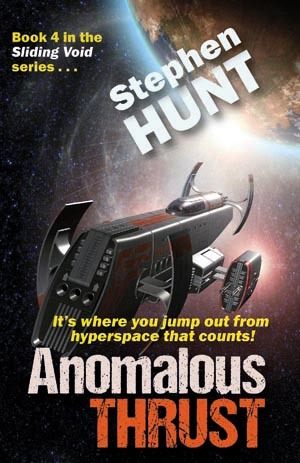 Anomalous Thrust is the 4th book in Sliding Void series. It’s a completely stand-alone adventure, not directly linked to the first three books (although Anomalous Thrust is set chronologically a year after the end of the previous books). It’s also full novel-sized, rather than novella-sized. Your feedback indicated you wanted it all at once, rather than drip-fed as a sequence of novellas; so this is what I did. Captain Lana Fiveworlds might be flying with the same motley crew of misfits, but her problems are all-new. Lana believes that a demanding and difficult client on board her beloved starship – the Gravity Rose – is the sum of her woes. But that was until she has to emergency ditch inside a star system which holds a full range of deadly secrets. There are the murderous intentions of the local government with its slave-owning aristocracy to contend with, not to mention the ruthless rebels trying to overthrow the regime. And then there’s the moon-sized unknown alien vessel that jumps into the system every few centuries, along with the chance to claim untold riches. Or the chance to die, well, really quite horribly. With Calder, Zeno, Skrat, Polter and the chief still helping Lana, there’s the smallest of chances the crew might survive. But as every spacer knows, it’s not where you jump into hyperspace that counts. It’s only ever where you end up! *That* is a pleasant surprise! And while clicking on it, I discover you also gave us the third book in “The Company of Ghosts” series: you’ve made me happy today! « The wicked wild wild web.